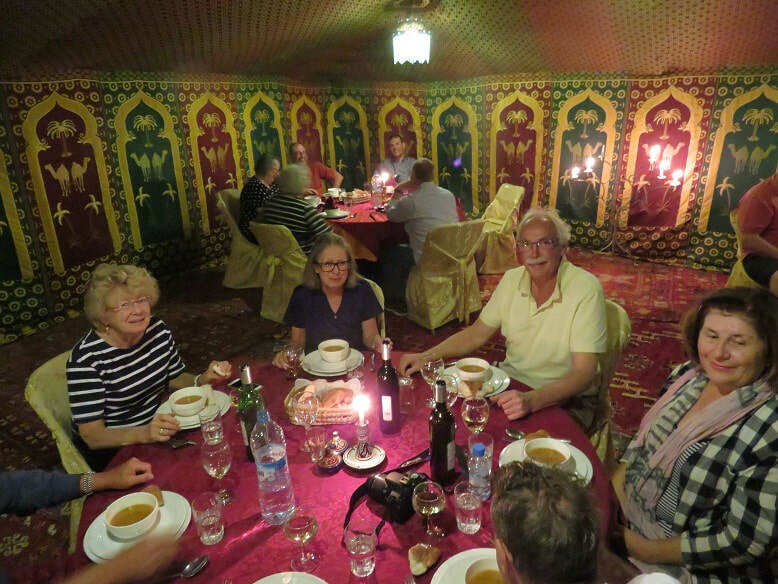 Our extremely comfortable coach arrives at Merzouga, a small Moroccan town in the Sahara Desert, near the Algerian border. 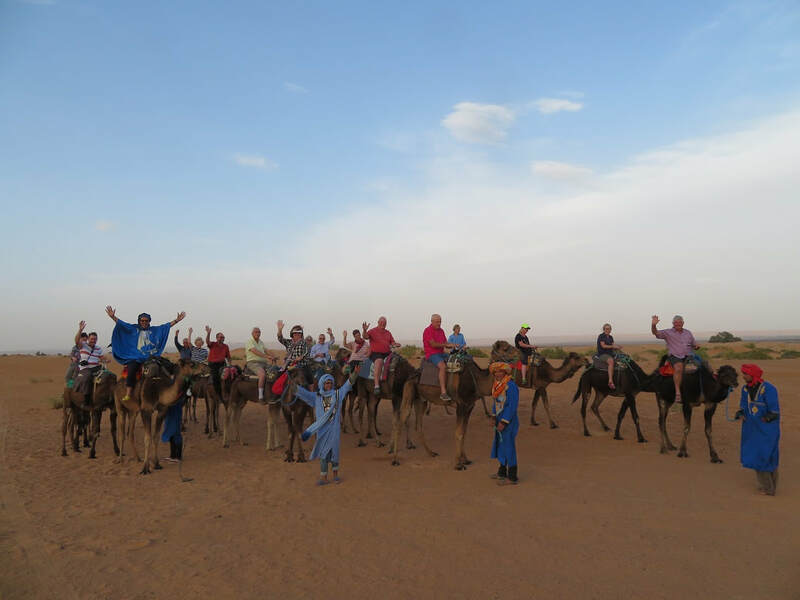 It’s known as a gateway to Erg Chebbi, a huge expanse of sand dunes north of town and our band of travellers are very excited. We are about to board some 4wd’s and head off into the Sahara. 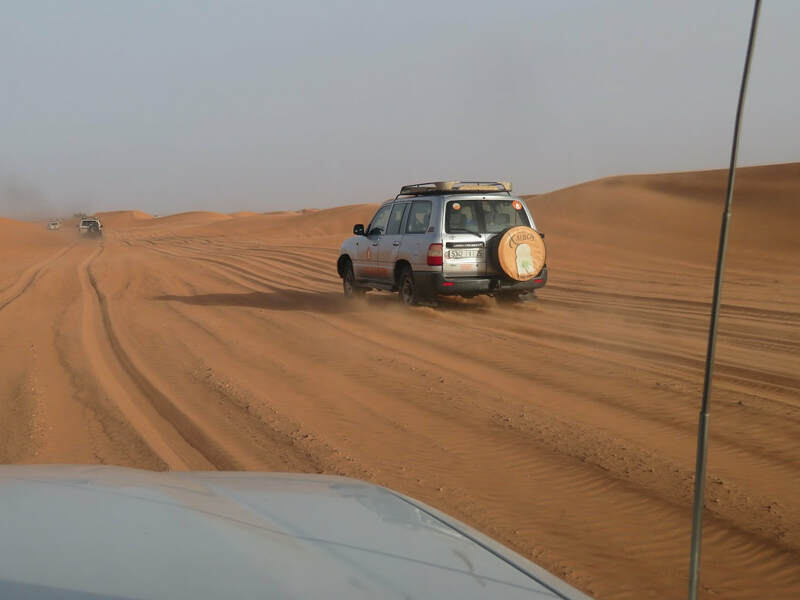 Our experienced drivers soon have us out of the town and turning off the road and into the sandy unknown. As we speed across the desert, the drivers take turns in leading our convoy and putting the cars into slides that raise our adrenalin. In fact, a certain lady, a fellow mature traveller, who’s name will not be mentioned was cheering our driver to go faster and faster. I think she might have been a bit of a wild one, in her youth! 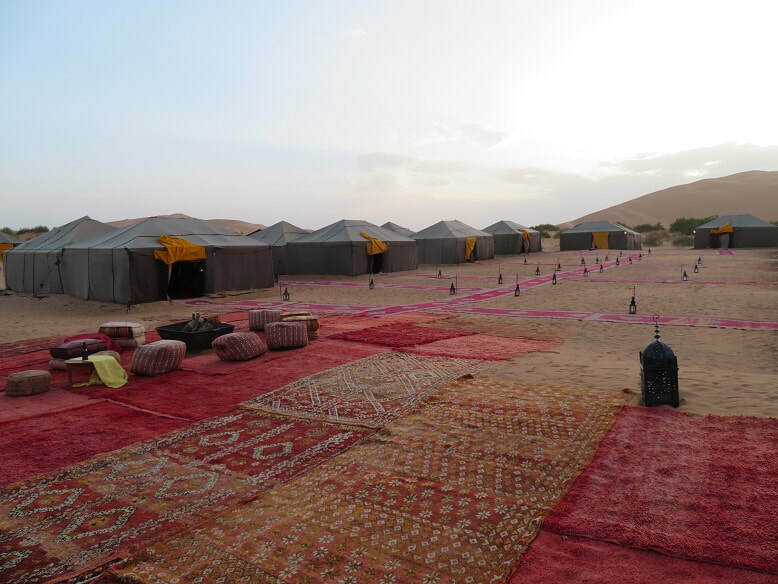 As we skim through the dunes, we come across the camp site. I mean, this is straight out of Arabian nights. Huge tents all laid out with colourful carpets and a common area with large cushions to sit on, all around a fire-pit (which did come in very handy, once the sun went down). We enjoy a welcome drink as our luggage is quickly carried to our respective tents. Then a very colourful camel train emerges out of the desert for those who are able go for a sunset ride into the wilds of the Sahara. Another rewarding experience. 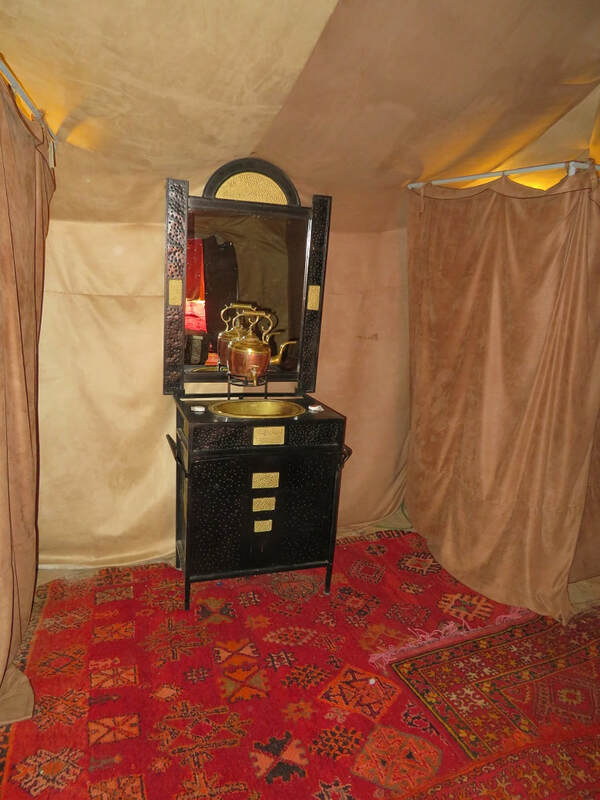 Our personal tents are well equipped, fully carpeted, a king size bed, side tables with lamps, electric lights, a change room with hanging space and separate shower and toilet. 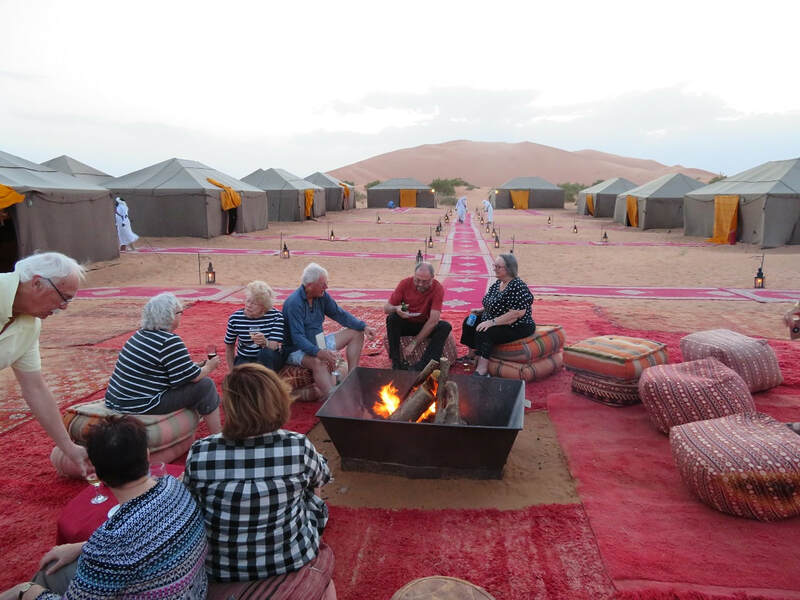 After setting up our personal items in our tents it’s time for sitting around the fire, enjoying a few drinks and watching the sun set over the dunes and then to watch a zillion stars start to emerge. Can it get any better? Of course it can! 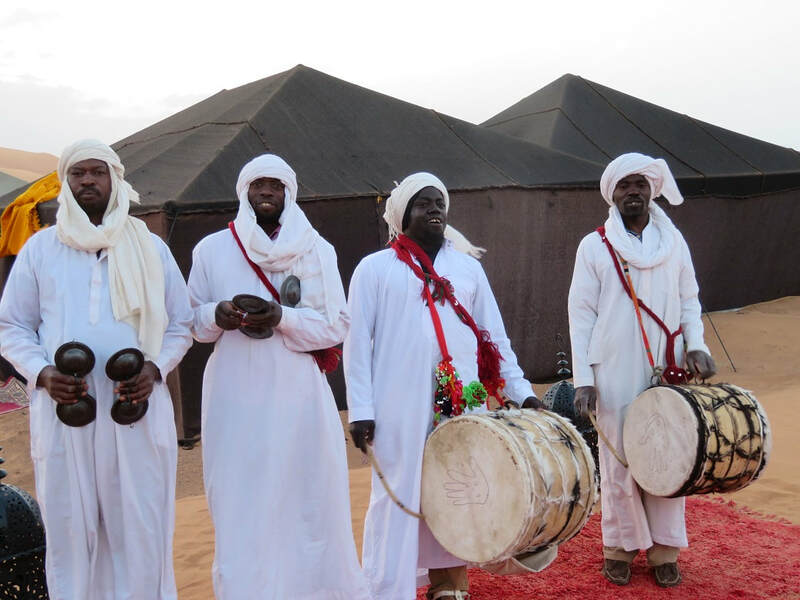 The band strikes up, with traditional Berber music to entertain us until we are called to ‘The Feast’. The giant size main dining marquee is again fully carpeted with a generous bar and tables groaning with finger food and snacks. Spread around are the tables for the evening feast. 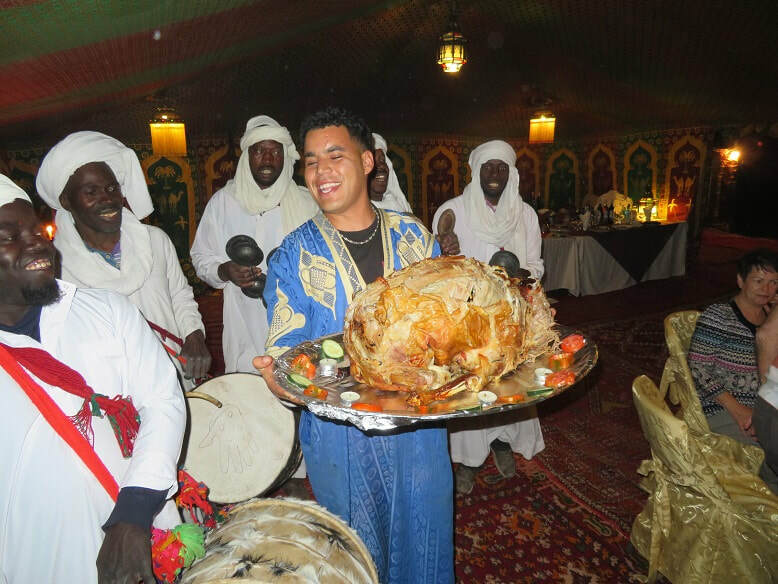 Once we are seated and more drinks applied, the ground crew present us with a special presentation of serving the food, accompanied by more music and singing as our fire cooked lamb is carried out on silver trays, with much pomp and ceremony. As with all our meals on the tour, a gastronomic delight, even though it has been cooked out in the desert. After such an absorbing day, some do make it to sit around the fire and reflect on the wondrous things we have seen. But the majority decide for a few more looks at the sparkling stars that fill the sky and off to our tents, to sleep the sleep of a very happy traveller. In the morning it’s back to the main tent and another feast (breakfast) is waiting. It is quite a feat, how they can do it in the middle of nowhere. More praise to Back-Roads for their superb organising. Then it’s back into the 4wd’s and back to Merzouga, where our coach is waiting. In Part Four; we travel to the magic Todra and Dades Gorge’s before reaching Quarzazate.